MPA students in grades PreK-4 are invited to be a Lower School Kid of the Game at a Boys Varsity Basketball home game! 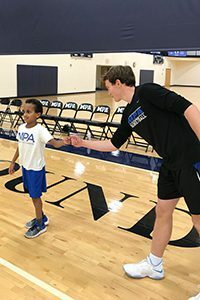 The Kid of the Game will be introduced before the game, join the Panthers and coaches on the court for pregame warm-ups, and receive an MPA basketball gift and concession stand item. Being a Lower School Kid of Game is free and siblings are welcome to be Lower School Kid of Game on the same night. The first home game is coming up on Friday, December 7! Sign up here for this game and future home games!